People can be aroused to action with a well-formulated presentation of the problems that evoke their sympathy. Thus we Filipinos need first to eliminate our illiteracy and ignorance, to educate ourselves so as to gain knowledge and understanding of the fundamental causes and remedies for social problems, including the economics, politics, and ethics of the problems and solutions. Then when we educate others, we must at the same time invoke their antipathy to the problems and arouse their sympathy with the remedies. It is and will not be an easy task. There are internal and external forces constantly at work to keep the majority ignorant. The internal forces (native government bureaucrats and technocrats or modern "ilustrados" with economic and political powers) and external forces (resident aliens, foreign businessmen and transnational companies (TNCs). They all remind us of the Spaniards who kept us natives (indio) uneducated, or the white Americans who kept the Negroes/Blacks illiterate for slavery. Rampant corruption in public offices, top to bottom is a symptom of disease: the disease of absent Filipino nationalism in combination with the disease of immature Christianity/religion shown by self-confessed Christians/Catholics. Without being repetitive here, I just want to say that all these have been discussed in previous posts. It may be tiring and seemingly hopeless, but we need to keep alive, to continue the discussion of fundamental issues that cause our predicament, especially to those who can not escape/emigrate, the uneducated, the impoverished. And hopefully, we can reach and help them gain an appreciation and understanding of "what's going on" and "why" the need to fight for the common good. Because without the impoverished majority knowing, they can not unite and act for radical changes that are long overdue. We may not see the realization now or during our lifetime. But we have to try and do so, for the next generations. For another, there's no place like home, our country of birth. That's how I feel and think. Below is an essay about us Filipinos and our revolutionary heritage by our famous novelist and social critic F. Sionil Jose. I liked his "what ifs" re Japan colonizing as for long. I think we would be more economically successful like them and the Koreans. I also agree with his assertion that we did not need communism as an ideology, Filipino nationalism is enough but we lost it under American tutelage and consequent Americanization of our mind and heart. Same with his comment regarding Our Filipino Religiosity. Our Revolution of 1896 is significant to me personally, not just as a Filipino but as a novelist. From it, I have deduced the influence of our revolutionary tradition on our nativistic movements; that revolution also made it easier for me to define collaboration as a moral issue. In this regard, I bring to mind Artemio Ricarte, a general of the Revolution who spent three years of exile in Japan and returned to the Philippines, only to die in the fastness of ifugao in the Cordilleras. In our celebration of the centennial of this Revolution, it is perhaps necessary to remind ourselves that beyond the festival tinsel, we should ask why we should remember at all, and what. All to often, we have ignored, through either blindness or self-lobotomy, what transpired fifty years ago when we were occupied by the Japanese and many Filipinos, out of convenience, collaborated with them. Or, for that matter, what happened at EDSA a mere decade ago when a despicable dictator and his family were forced to flee. If the past means something to us, it is because it reminds us of the good old days - their comfort, the wonderful times enshrined in memory. this is pure and simple nostalgia which does not have any more meaning than would a gargantuan feast, or some orgiastic experience that will forever haunt us with its magic. But beyond this, what then? To remember the antique grandeur of Intramuros or the sybaritic Ermita and Malate of the thirties in an upper class luxury, particularly for those who lived in such districts when these were at the height of their glory. Why these enclaves of power and privilege? When we ask this question, we then come to the core of what ails our country, and why revolution was -and is- the answer to this most basic of our internal contradictions. we then realize it was not so much the foreign interloper that brought perdition to our society, but that most insidious of exploiters -internal colonialism and the agrarian discontent it spawned. A hundred years from now, those who will perhaps remember the grandeur of Forbes Park, the snobbery of Makati, will they consider these districts as the supreme monuments to internal colonialism too? My first awareness of the Revolution of 1896 came when I was very young, perhaps six or seven years old. Memory being rusted by the years, I'm incapable of totally recalling how my grandfather brought his whole clan to the plains of eastern Pangasinan, to a village called Cabugawan -from the town of Cabugaw in Ilocos Sur from whence they came. My grandfather died when I was very young; the stories I heard from him, from my mother and aunts and uncles were hazy bits, that, later on, I put together as in an Andalusian mosaic. He was perhaps in his sixties, his white hair cropped short. It was his feet which I could not forget, for like other farmers in our village, he had never worn shoes. it is not possible to work the muddy fields with shoes or slippers. Ginger - that was what the peasant feet were called because the toes were splayed, like ginger, and the soles were thick and cracked. I called my grandfather, as did the others in our family, Ba-ac, an Ilokano term of endearment for anything that is aged like cane wine, or the big, leaf tobacco which the women hand-rolled into cigars or pressed into cubes of chewing tobacco. Grandfather was a soldier of the Revolution; in our house was a rusting length of iron with a pointed end. I was told he used it during the revolution, not as much as a weapon but as a rod to prod the earth for buried treasure left by the Spaniards, much like the way Yamashita's treaure is hunted today. Grandfather had no gun -I was told that he and so many of the revolutionaries were armed only with bolos. Grandfather spoke a few Spanish phrases, among them "sin verguenza" which he applied to the Spaniards and, later on, to the ilustrado mestizos who dispossessed him of the land he had carved out of the wilderness. In later years when I was writing Po-on, one of my novels about the Revolution and the Ilokano hegira, I recreated Grandfather as the embittered old man who fulminated against the Spaniards. Ethnocentric Tagalog writers are perhaps right when they say that the Revolution was essentially a Tagalog response to Spanish tyranny. But then, grandfather was not Tagalog, and so were the host of other revolutionaries - Antonio Luna, Bishop Aglipay, both of whom reconnoitered the north for a possible escape route when the defeat of the Malolos republic by the Americans was imminent. And in the Ilokos, many Ilokanos continued fighting the Americans even when most of Luzon was already conquered by them. And finally, there is General Artemio Ricarte,.originally from Batac, Ilokos Norte, lie most well- placed Ilokanos, he went to Manila, where he imbibed early enough the ideals of the revolution. As one of the founders of the Katipunan, Ricarte figured in the early battles with the Spaniards in Cavite where he taught school. then the Americans came. After the collapse of the organized resistance to the new colonizers, he refused the pledge of allegiance to the United States. Consequently, he was exiled to Guam together with Mabini and the rest of whom the Americans regarded as recalcitrant. Unfazed by his exile in Guam, he returned to the Philippines. here he continued opposing the United States for which reason he was again exiled this time in HongKong. He returned to the Philippines in secret and continued his activities was captured and imprisoned in solitary for six years, after which he still refused to pledge allegiance to the United States. Exiled for a third time, he finally went to Shanghai and from there, to Japan where he took odd jobs and lived in penury. Fortunately, he had a friend, Goto Simpei, who became mayor of Tokyo and later on, foreign affairs minister. 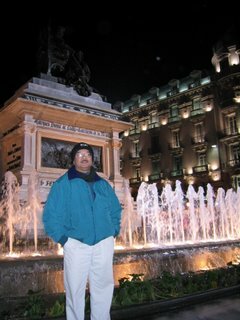 To Ricarte, he gave the job of teaching Spanish to Japanese emigrants to South America. Ricarte's wife joined him in Yokohama where she started a Philippine restaurant and sold Ricarte's book on the Revolution to Filipino visitors., most of whom them sailors or passengers in ocean liners. With the Japanese Imperial Army, he returned to the Philippines via Aparri in 1942 wearing the uniform of a Japanese shogun complete with a Japanese sword. He must have been extremely disappointed that the Japanese did not appoint him to a high position. Not only was he already too old, the Japanese used the same old elite to rule as their puppets and initiate social, structural changes. A few years ago, on a Japan Foundation grant, I stayed in Japan for six months to research on a novel about this doughty Ilokano. I interviewed the few living Japanese who knew him, one of them an aging civilian who had been in the Japanese Army and Ricarte on his last days. His former aide and student, Colonel Ohta, wrote a book about him, Even the Devil Will Weep, which recounts Ricarte's tribulations. he bore them all, in Japan as well as in the Cordilleras, with stoicism and pride. Ricarte wrote a lot in exile; visitors as well as relatives attest to this. Certainly, a man as well-informed as he must have followed with interest the imperial advance of Japan into China and earlier, into Korea. Surely, he must have known of Japan's hegemonic ambition in Asia, as well as the non-democratic nature of Japanese society, its censorship, its emperor worship. We may assume he not only approved of these, but that he also appreciated them. Would he then have wanted the Japanese to rule the Philippines as they eventually did? These are grave questions which must be answered, for the truth of the matter is that Ricarte was an active Japanese collaborator, out of sincere admiration for them and perhaps for no other reason. His relatives say that by 1935, he had already ceased being anti-American, that he recognized what the Americans had positively achieved -their promise to give independence after the Commonwealth. If he approved of the American regime afterwards, why did he not come home when he was offered a very good position in the government by President Quezon, Paredes and other Filipino leaders who had visited him in Yokohama? Was it enough that he sent his wife to attend the 1935 Commonwealth celebration? But if he did collaborate with the Japanese, a distinction must be made -he committed no treason to the United States. he had not sworn allegiance to that country the way so many Filipino leaders had. He did help many Filipinos escape death by appealing to the Japanese, and at times went beyond the authority given him for which he incurred their ire. Wanting to show his independence, he tried to form his own militia -a quixotic act because it would not have flourished without Japanese arms and approval. The Japanese used him instead in their pacification drive and sent him on speaking terms all over the country. General Ricarte had an ultra-nationalistic agenda; he would change not just the name of the Philippines but many Spanish names; for instance, the days of the week. Beyond this trivia was his deep hatred of the ilustrados whom he considered traitors to the Revolution. When he returned incognito to the Philippines from Hongkong, he met Aguinaldo and other comrades and urged them in cleansing the country of such traitors. Aguinaldo counseled patience. Why did he retreat with the Japanese Army to the Cordilleras towards the end of the Occupation? Was he in fear of his life as a collaborator? Why did he not stay behind where the possibility of his surviving the war would have been better? I shall describe this act not so much as a gesture of his final collaboration with the Japanese. he was in his seventies -the past was all behind him. I think he was being true to himself. That was his undoing. It is fairly well established that if the United States had not taken over the Philippines at the turn of the century, Japan would have been quite ready to do so. Maybe in the long run, if it were Japan that had colonized the Philippines, it would have ended for the better. Being cruel, they would have maltreated us but at the same time, established exploitative industries and thereby transferred to the Filipinos a stern kind of work ethic. In all probability too, we would not have gotten the terrific hangover from the American colonial experience,given the benign nature of American colonialism and the openness with which the Americans dealt with us. But to go back to the 1896 Revolution, its influence on the nativistic movements like the Colorums and the Watawat Ng Lahi was very strong. In my conversations in the early fifties with the late Pedro Calosa, founder of the Colorums of Tayug, he maintained that it was the heroes of the revolution, most of all Jose Rizal, who inspired them. Mabini, Bonifacio -all of them who fought for the country's freedom were enshrined in the colorum pantheon because they were men who fought for Filipino freedom. The Colorums also believed these men were "gods;" that "God created land, water and air for all men, that it was wrong for one man or one family to own so much while the rest of humankind had nothing." It was such a belief that led them to rise in revolt in 1931 -they tore their cedulas then took over the municipal building of Tayug in Pangasinan, suffering as they were from the harshness of the landlords in the area. It was the same with the "Watawat Ng Lahi" in Laguna led by the late Valentin de los Santos with whom I had also conversed in the mid-Fifties. In 1965, like the Colorums they massed on Taft Avenue where they were massacred by army troops which did not know how to deal with them. Like the Colorums, they had believed in their invincibility, their quasi-Latin chants (from which their name Colorum came from, their sacred amulets that would protect them from bullets - the same belief that had so imbued many of the 1896 peasant soldiers, for which the Americans considered them fanatics. Although the succeeding rebel movements, the Huks and the New Peoples' Army (NPA) were agrarian-motivated, the influence of the 1896 revolution was no longer evident in both movements. The Maoist communist party behind the NPA's did not draw either sustenance or inspiration from the Filipino revolutionary tradition. It could have easily discarded its Maoist mambo jumbo and relied wholly on the teachings of Mabini, Rizal and others who had fueled the propaganda Movement. As I said then, and I repeat today, there was enough in our revolutionary tradition to color the Revolution, not red but nationalist. But the leaders of the NPA were doctrinaire communists - they failed to show their own reading of what they considered the "objective reality," and they missed their place in history by boycotting the 1986 elections and absenting themselves from the EDSA uprising that same year. This lesson should not be lost on us now, or on future generations that may yet bring invigorating change to the country by destroying or emasculating the oligarchy and restoring what our politicians call "people power." Ricarte's collaboration with the Japanese in instructive too, in the sense that it gives "collaboration" many nuances and grey areas. Collaboration is far more complex than it appears although its stigma is really simple -collaborators are individuals who aid the enemy in the conquest of their country and in the murder of their countrymen. It is in this sense that, indeed, collaboration in its simplest form is treason. But the variations need looking into. Is the collaboration borne out of sincerity or is it coerced by fear? The Sakdals and the Makapilis -peasant organizations- cooperated with the Japanese out of the simple belief that Japan was going to help liberate the Philippines from imperialism. How about those opportunistic individuals who collaborated with the enemy for profit? And worse, how about those who, aside from conniving with the enemy, themselves killed their own countrymen? Ricarte collaborated with the Japanese -this is the simplest and most basic fact about him. Did he also commit treason like the other Filipinos who did collaborate with the Japanese and brought harm or death to their countrymen? We have heard all their arguments - that without them, it would have been worse, that they have helped their countrymen survive the war (and Marcos), that as bureaucrats they had no choice and were only following orders. Herein lies the ambiguities of history, of our attitudes to the collaborators. Herein too is the root of our moral malaise which we must somehow resolve if we are going to give our politics a truly moral basis.This moral malaise, it seems to me, lies deep in our past, in our having forgotten what the Revolution of 1896 really meant although we continue to lisp its significance. The revolution was a rejection not just of tyranny but of colonialism; and somehow,those who helped the colonialists -foreign as well as native- have never really been brought to justice; not just those who collaborated with the Spaniards but with the Americans, the Japanese and in more recent times, with Marcos. There are those who rationalize our moral malaise as an inevitable continuum from the Spanish regime when corruption was rife. Ditto with a church whose liturgies and penances were available for a price. Yet long before World War II, when candidates for political office impoverished themselves; they had to spend their own money for their campaign, for feeding the electorate. Foreigners have marveled at the Filipino capacity for forgiveness. I would call it lack of memory. They see in our country the monuments that the Japanese built to commemorate their war dead. In Mabalacat, Pampanga, for instance, is a monument to their kamikaze pilots. This would never happen, they say emphatically, in Britain, in France, in the countries occupied by the Germans.To this very day, those in the French Vichy government who were exposed for collaboration with the Nazis are on trial, and several of them have been executed in the past. Only in the Philippines could such collaborators who actively helped Marcos in his plunder of the country, parade themselves on TV screens, write columns in the newspapers. Only in the Philippines can someone like Imelda Marcos return to power and have her children idolized. Bongbong Marcos went to UP sometime back -the UP of all schools- and he was mobbed by students seeking his autograph. The Revolution of 1896 was riven with many contradictions, clashing interests. Poor Mabini -in my novel Po-on, I had attributed his paralysis to syphilis as was the information I got from the late Teodoro Agoncillo and Cesar Majul. I met Cesar in the Fifties when he had just returned from Cornell where he did his Ph. D dissertation on Mabini. When I told him I was from Rosales, Pangasinan, he told me that Mabini had stayed in my hometown before he fled to nearby Cuyapo, Nueva Ecija, where he was eventually captured. I knew then that Po-on would be anchored on Mabini's stay in Rosales, his ideas and ideals. The rich ilustrados had a plan to milk the Malolos government, and Mabini stood in the way, for which reason he was gossiped about -it was said that his paralytic condition was due to syphilis. Years later, in the Eighties, Ambeth Ocampo explained his bones were exhumed and the specialists found out he had suffered not from syphilis, but from polio. I had done his memory irreparable harm for which I am deeply sorry. Because of the contradictions in 1896, I surmised that if the Americans did not come, we would have had a civil war in twenty years. Carmen Guerrero Nakpil who is more sanguine said: "Not twenty years but a couple of years." My novel Po-on which ends with the battle of Tirad Pass, required that I do a lot of reading, not just on the revolution but on the social life of the period. I had to go to Tirad Pass, too. from Candon, Ilokos Sur, we turned right towards the town of Salcedo at the foot of the Cordilleras. On a clear day, Tirad, which means "pointed" in Ilokano, is visible. below is the pass. it was November and the rains had lifted. It would have have been difficult for my wife and me to reach Mt. Tirad during the rainy season because the Buaya River which we had to cross several times would have been bloated. But in November, the river could be forded on foot. We hired a jeepney in Salcedo but left it in the last village as it could no longer make the ascent, and we had to climb on foot. A few words about Tirad Pass -during the Spanish Times, it was the short cut from the Ilokos for those migrating to Cagayan Valley. It was widened so that horses and water buffaloes, but not bull-carts could cross. Those who took the circuitous route went down to Pangasinan, across the Caraballo Range through the Sta.Fe trail now called the Dalton Pass after an American general who was killed there by a Japanese sniper in 1945. The Revolution was our moment of truth; in that shining episode we defined ourselves and confirmed, not just our heroic and revolutionary tradition but also our continuous struggle for freedom. Our revolution laid down the foundation of a nation. For so many centuries like our neighbors, we were so many tribes in many islands often fighting one another. as the fictional Mabini states in Po-on, "we will build a nation not of tagalogs alone, but also of Visayans Ilokanos, our Muslim brothers in the South." Mabini did not say this exactly in this phrasing, but having read so much of his writing, I am sure this was what he would have said. In the conclusion of his major work, The Roots of the Filipino Nation, O.D.Corpuz opines that "extra constitutional processes" -either a coup d'etat or a revolution -will do away with our decrepit political system. I hope that such would indeed, happen, although I am quite sure that I will not see a revolution triumph in my lifetime, that perhaps as Rizal had expounded, education will be slow but better alternative, I nonetheless feel it in my bones, in my deepest being, that our internal contradictions will yet to be resolved. However bleak my views, in the pith of my feelings is everlasting hope. If I were such a hardened pessimist, I would not not be writing at all, for what is the use? I have always maintained that tradition has its often unperceived shackles; we are not fatally bound by them the way some people of the world are so crippled believing as they do that "they are born unequal, they live unequal and they die unequal." When I visited a neighboring country in the Fifties, I was invited to a merienda by a minor member of that country's royalty. I was shocked when the maids brought the food, crawling on the floor. We may ponder to the gods, but we do not grovel before them. A few decades ago, thousands fled from the poverty of Spain to work in Europe. When these Spaniards returned, not only did they bring home new skills -their eyes were wide opened and helped bring about new attitudes that have transformed Spain today. It is my hope that when our thousands upon thousands of overseas workers come back, they will also be the harbingers of change. Since we have long been nurtured in democratic institutions, we shall be able to banish the curse of our society -a corrupt and expensive political system. We have seen this development slowly through the years- first with Magsaysay going to the barrios, and our lower classes finding their voice. We now see in our midst the new crop of nontraditional politicians concerned more with performance than patronage. As our people mature politically, we shall be able to abolish Congress as it stands today, limit the number of lawmakers to the provincial governors who will then meet only four months a year. God knows we have so many laws that are never implemented. It is not true that the government has neglected the Muslims; through the years, billions have been poured into their region, but much of it disappeared in the seemingly bottomless pit of Muslim corruption, exacerbated by the Moro social elite (datu system). as Misuari is now finding out, it is this endemic corruption -worse than that among the Christians -that will derail whatever development plans he has. Again, heroism as shown by the Moros against the Spaniards, the Americans and the Armed Forces must be channeled into this struggle -more Koranic than they themselves realize. The justice system is obviously corrupt, from the lowest courts to the highest. Overhaul it completely? Who in the highest echelons of power will have the guts to do this? Not when everyone seems involved. In fact, if the peace and order situation continues to deteriorate, the people would not be wrong to assume that the old-boy ties among the police and the Army leaders are what dissuade them from acting swiftly and with courage. In the closest of most high-ranking officers are skeletons; they must protect each other from exposure. And what about the succeeding generation of military officials? Only time will tell if they will break away from from tradition of pakikisama. Indeed, it is time for those in our police and Armed Forces who truly believe in reform or revolution, or both, to join hands with those of similar thinking in the fractured Left. It is, perhaps, this amalgam of "new" men committed to the building of a new nation in whom much of our hope for the future will repose. Who will be the men and women in both the Armed Forces and the Left who will come forward to do this? The line forms in the middle. As for the persistent agrarian problem, the solutions propounded in the Fifties may no longer be valid -for one, there is not enough land now to distribute to the tillers. But there are still ways by which agricultural production can be improved so we would be self-sufficient in food, and with this modernization, the twin objective of equity should also be pursued. Consolidation, more irrigation systems, rural credit and cooperatives, the banning of additional golf courses and most of all, the introduction of agrarian reform in the sugar and coconut lands -these are imperatives. In fact, urban land reform should also be pursued relentlessly. Eventually too, I hope that our churches will be empty as they are in Europe, not because we have become atheistic but because we have realized that our progress depends on our own efforts and not on divine will. Our salvation lies in resuscitating our revolutionary tradition, in acting out the indelible lessons of our history -most of all, its selfish heroism. Indeed, we are heroic people. While researching for my novel, Po-on, I came across photographs of our soldiers in the revolutionary army -in the trenches where they were felled by American guns. They were barefoot because they were peasants. So is it today; the enlisted men in the Armed Forces of the Philippines, the cadres of the New People's Army and of the Moro National Liberation front -they are peasants fighting the ancient war against one another, and perhaps, against the Filipino oligarchy as well. Po-on ends with the battle of tirad Pass on the morning of December 2, 1900, on the roof of the Ilokos, the Cordilleras. here, the young general, Gregorio del Pilar, defended that pass so that General Emilio Aguinaldo could flee the pursuing Americans, Del Pilar had sixty men to face a well-equipped, superior Texas Rangers; of the sixty, only seven survived and Del Pilar himself fell in this heroic stand -no different from the battle of Thermopylae where the Spartans died to a man defending the pass against the invading Persians. In these moments of despair, of grieving over the rubble of our dreams of a beautiful Pilipinas, I think, too, of Rizal returning to his beloved homeland although he knew death awaited him there. And most of all, I remember my grandfather -barefoot, defying the Spaniards and the Americans with nothing more than a blade. Greetings from the National Capital Region, PHILIPPINES! I encountered your postings at CEBU POLITICS through e-mail notice digests. Noting your patriotic stance, even if you are already a US citizen as I surmise, I was intrigued to check out your blog "The Filipino Mind" via the link included in one of your posts. At "The Filipino Mind", I noted your offer to send PDF of selected books and publications. Top of the list is The Mis-education of the Filipino - Prof. Renato Constantino (Published 1970). I would like to request for copies of the entire selection you posted in your blog, to help in the distribution to as many Filipino Citizens I can reach, in and out of cyberspace. That is the minimum I would like to accomplish in communicating with you. I do not know your particular life context, and so I am not sure whether you can still have the time to share to be involved in a collective and collaborative "Culture Change Management Program" for Filipinos based in the Homeland, which will be pursued by SPHP GLOBAL NETWORK over the long term. Below you will find samples of the customized versions of the template sent to identified "Agents of Change", whether as individuals or as members of "Change Management Organizations". To get a feel of where SPHP GLOBAL NETWORK is at this time, it is best for you to drop in for a visit. Just CLICK on either of the following LINKS or COPY AND PASTE into the "Address Bar" of your browser for a brief ON LINE registration at no cost. Looking forward to your visit to SPHP GLOBAL NETWORK! Mabuhay ang Pilipinas! Mabuhay ang Bagong Pilipino! Seems like you have something against resident aliens/foreign businessmen and make them a blight in your scene.. Is that truly so? If so, you would have to explain why Malaysia could succeed and Philippines apparently not. You would further have to explain the righteousness and fairness of your comment in view of the fact that relatively few foreigners live in the Philippines, while millions of Filipinos are in many countries, with a ratio of 10:1 or more in favor of Filipinos. How about reciprocity or fairness? Is that a concept you consider at all? How about age old migration in general? Some foreigners just like it here, like me having been here 34 years. Some (many?) Filipinos like to live abroad. Does that go against your nationalistic grain? One could easily get the impression that you just pathologically hate foreigners, unless reasonable answers dispel that. Love of country and patriotism are legitimate (and today mostly lacking) sentiments. So let us define where patriotism ends and xenophobia starts. Apparently as a foreign resident you tend to think that I am xenophobic. If you're a businessman or a TNC executive, how do you treat your native employees? If you exploit them, then rest assured I do not like you in my homeland. As to many Filipinos wanting to go abroad, where have you been? 34 years in the Philippines you claim - don't you know nor understand why? As to why Malaysia progressed via-a-vis the Philippines, your 34 years should have also given you the explanations. Malaysia did not do what the Philippines did. I have discussed this topic in a previous posting. If you truly care, visit and read my blogsite and you'll know and understand what I believe in,talk and rant about, care and fight for. And understanding is not the same as agreeing -which I do not expect from any foreigner or fellow native alike. 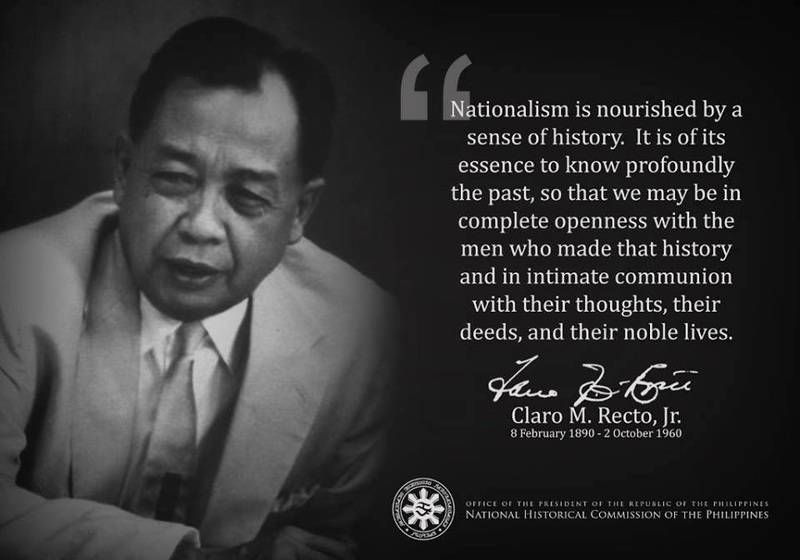 Filipino nationalism or patriotism are well covered in them too.